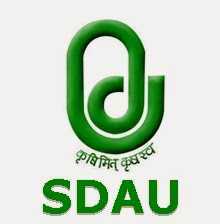 SDAU Jobs Recruitment Notification 2018.Sardarkrushinagar Dantiwada Agricultural University, SDAU inviting applications for the positions of Veterinary officer/ S.R.F, Contractual Laboratory assistant, contractual driver, farm labour and supervisor posts on contract basis for a period of 11 months.Interested and Eligible candidates can apply for the positions. Number of vacant posts in S.D Agricultural University is 37. B.V.SC & A. H holders can apply for SRF/ Veterinary officer post. Degree holders in B.Sc Chemistry/ microbiology can apply for laboratory assistant post. DVSC & AH holders can apply for livestock assistant and supervisor posts. 12th standard pass candidates can apply for driver post. Farm experienced persons can apply for contractual farm labour post. 18 to 45-year candidates can apply for farm labour post. 18 to 38 year candidates can apply for driver post. For all remaining posts the applicants age can be in between 18 to 33 years. On 28th August 18 candidates can attend the interview for SDAU recruitment. Research Scientist (Livestock) Livestock Research Station, S. D. Agricultural University, Sardarkrushinagar.